Few institutions have the reach and impact of the University of Pennsylvania. Its long tradition of the pursuit of knowledge and educating future generations goes back more than 265 years. Today, the University of Pennsylvania is among the most prestigious universities in the world, with its reputation built upon the accomplishments and generous support of its distinguished alumni and donors. Despite that decentralization, Penn sought a way to universally acknowledge the various segments of its donor base, including alumni, parents, and friends. Originally, Penn accomplished this through print, with a thank-you book that it mailed to donors who had given $2,500 or more. However, several years back, Penn sought a digital platform through which it could include and thank all donors, regardless of giving level. For the past several years, eCity has worked with Penn to build and improve upon People Supporting Penn, providing an interactive way to highlight and thank donors from the previous fiscal year and allow donors to share their pride through easy social sharing tools. “PSP is rather complex,” says Harris, “so our goal is to make it as user friendly as possible so donors can easily find their names.” To accomplish that mission, eCity has worked alongside Penn to incorporate multiple donor databases into one complete list of over 112,000 donors searchable across the various benefiting University groups. We’ve organized large volumes of content on the site in an elegant way that highlights the stories of various donors and groups. Users can now browse and filter through donors by multiple parameters, including donor name, school, class year, school level, and giving society. The interactive presentation of the donor lists provides context for the donors as they browse, and has proven to be a tool for the individual school giving centers to encourage future giving. One key update in 2017 was making Penn’s video message more prominent on the site. Two months after launch, eCity updates have led to a 67% increase in video plays year-over-year, a key success metric for Harris and the Penn alumni team. “Overall, our main goal is always to increase viewership, of both the donor stories and the President’s video message,” says Harris, who notes that these tactics require a sizable time investment from internal Penn stakeholders. 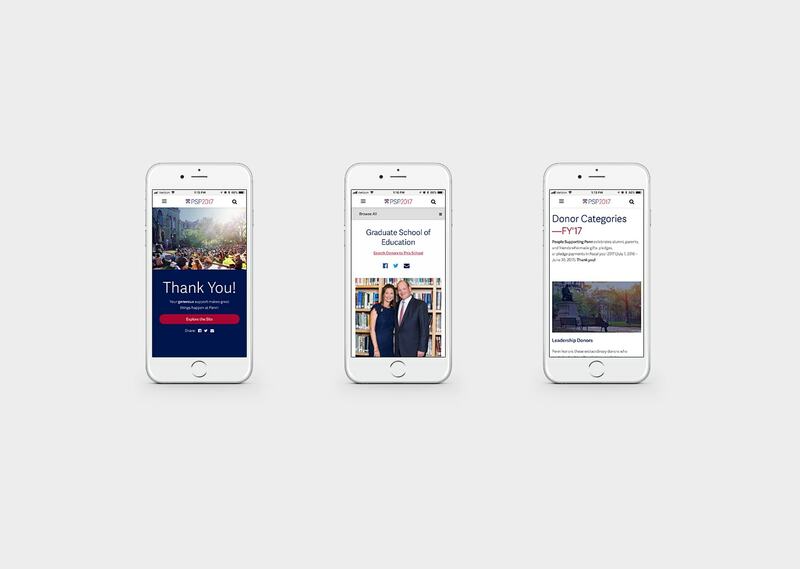 For the University of Pennsylvania’s stewardship communications team, People Supporting Penn is a creative project meant to demonstrate the accomplishments, advances, and noteworthy people around Penn in a visually appealing and engaging way.